He was born in Kues, Germany (hence "of Cusa") to a merchant family, and received his doctorate in canon law from the University of Padua in 1423. After a successful career as a papal legate, he was made a cardinal by Pope Nicholas V in 1448 or 1449, and was named Bishop of Brixen in 1450. His work as bishop was opposed by Archduke Sigismund of Austria; the duke imprisoned Nicholas in 1460, for which Pope Pius II excommunicated Sigismund and laid an interdict on his lands. 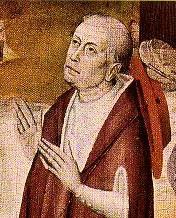 Nicholas of Cusa was never able to return to his bishopric, however: Sigmund's capitulation in 1464 came a few days after Nicholas's death at Todi in Umbria. Nicholas of Cusa was noted for his deeply mystical writings about Christianity, particularly the nature of the Trinity. Many believe he was influenced in this by the work of Thomas a Kempis. He was suspected by some of holding pantheistic beliefs, but his writings were never accused as being heretical. Most of his mystical ideas can be found in his essays, De Docta Ignorantia (http://cla.umn.edu/jhopkins/DI-I-12-2000.pdf) (Of Learned Ignorance) and De Visio Dei (Vision of God). Nicholas is also considered by many to be a man ahead of his time in the field of science. Though he predated Copernicus by half a century, Nicholas suggested in some of his scientific writings that the Earth was a nearly spherical shape that revolved around the Sun, and that each star is itself a distant sun. He was not, however, describing a scientifically verifiable theory of the universe: his beliefs (which proved uncannily accurate) were based almost entirely on his own personal speculations and numerological calculations. He made contributions to the field of mathematics by developing the concepts of the infinitesimal and of relative motion. Nicholas's body now lies in the Church of St. Peter ad Vincula in Rome, but his heart is within the altar at the hospital in Kues he founded and bequeathed his entire inheritance to: it still stands, and serves the purpose Nicholas intended for it, as a home for the aged. Christianity > Catholicism, Angela of Foligno, Dante Alighieri, Jean Pierre de Caussade, Mother Teresa, Nicholas of Cusa, Saint Francis of Assisi, Saint John of the Cross, Saint Teresa of Avila, Saint Thomas Aquinas, etc.